Thanks to our penchant for baking, we are always on the lookout to find breakfast foods that can be baked, aren’t full of sugar, and are fun to make. Sure, muffins are delicious, but sometimes we don’t want to start our day with a dessert. Enter these scones- they are perfect for your baking craving and go nicely with a plate of scrambled eggs, no bacon needed since it’s already in them. That’s not to say that they’re healthier than your typical muffin or coffee cake- that’s definitely not the case. 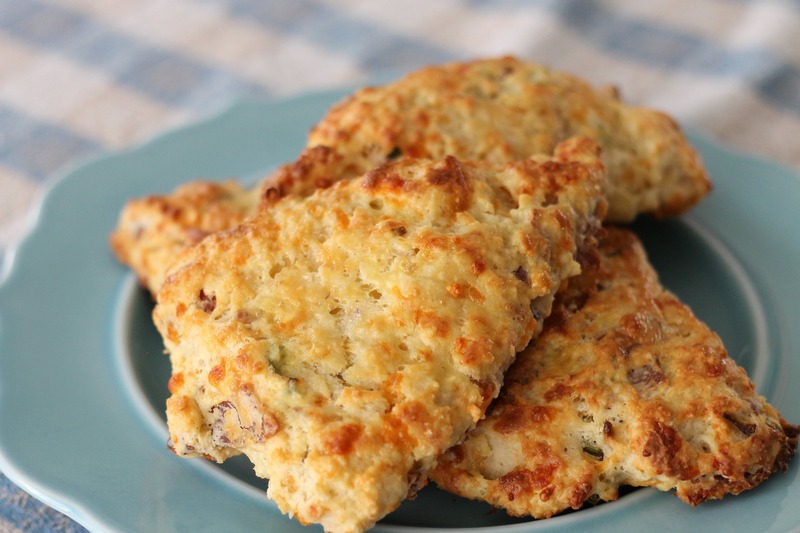 You start with a light and fluffy scone that is reminiscent of a biscuit and add chopped bacon, scallions, cheddar cheese, and black pepper. There’s a lot of flavor going on in these, and they make a very hard-to-stop-eating breakfast. Give them a try this weekend! In the bowl of a stand mixer fitted with a paddle attachment, combine flour, baking powder, salt, and black pepper on low speed. With the mixer running, gradually add cubes of butter until the mixture is crumbly and butter lumps are no larger than the size of small peas. Add grated cheese and stir just until blended. Add green onions, bacon and 3/4 cup of the buttermilk to flour and cheese mixture. Mix by hand just until the ingredients are incorporated; be careful not to over mix. If dough is too dry to hold together, use remaining buttermilk, adding 1 tablespoon at a time, until dough is pliable and can be formed into a ball, being careful to stir as little as possible throughout the process. Remove the dough from the bowl and place it on a lightly floured flat surface or on a piece of floured parchment paper. Form the dough into a ball. Using a well-floured rolling pin, roll the dough into a circle about 10 inches wide and 1/2 inch thick. Cut the dough in 8-12 wedges. Whisk the egg and water in a small mixing bowl to combine. Brush each wedge with egg wash. Bake for 18 to 22 minutes, or until golden brown and cooked through. Serve warm. Enjoy!